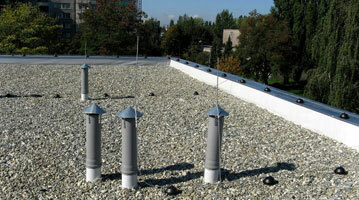 Are you constantly having flat roof leaks? We can help. In Canada the average life expectancy of an industrial flat roof is less than 15 years. Regardless of if it is properly installed, time, weather and debris lead to corrosion and any commercial roof will eventually have to undergo maintenance and repairs in due time. A large factor to consider is the fact that a flat roof gathers and holds debris because there is no steep slope for it to slide off of. Many industrial flat roofs even have specific weaknesses from their original roof design - areas around pipes, ventilation ducts, etc can often cause a leak. Flat roof leaks or moisture issues are more difficult to diagnose and repair than on a peaked roof. The staff here have the knowledge, tools, technology and expertise to locate and stop any leak. When we perform flat roof repair we are not just applying a bandage that will only last until the next rainfall, we perform industrial roof repairs to completely eliminate the leak. We value our clients very much but the less often we see them the better for them! The earlier an industrial roof leak is detected the better, and with such high-quality techniques and practices used by us, you can be assured that your business and its roof are being protected by the best. What are a few benefits of having flat roof repairs? With all of our experience we can perform repairs and replacements on any type of industrial roof but we specialize in Built-Up - tar and gravel, Modified Bitumen – asphalt with modifiers so it appear plastic or rubber-like, EPDM – synthetic rubber and PVC – rubber-like plastic. Perhaps you are not certain of the type of commercial roof you have? Give us a call, we can tell you! Why is maintenance on industrial flat roofs needed on a regular basis? To remove any debris left on the roof, to detect and repair new and existing leaks, to check for any damage created by other trades that may have been on your industrial roof, for emergency blow-offs, any roof penetrations that require caulk and sealing, regular preventative flashing and sheet metal maintenance, hail and snow damage, (yes we live in Canada) and to follow up after the installation of new rooftop equipment. Our flat roofing technicians have the expertise to meet and exceed your expectations. Allow us to perform your roof repair that will greatly extend the life of your existing roof. Give us a call for your commercial roof repair needs.